The Platinum Plus is one of the top tier ovens made by ilFornino. It is made from heavy gauge stainless steel with an attractive Octagon Dome. The ilFornino® Platinum Plus flooring is made from 1.5" thick One Flat Cooking Surface™ that guarantees an even heat distribution and retention. Adjustable height from 30"- 42". ilFornino® Platinum Plus comes with the adjustable height stand. You can easily remove the oven and place it on top of an outdoor kitchen mantel. Oven outside dimensions: 46" L x 34.5” W x 21.25" (to the base of the Chimney). Height of chimney stack is 32.50" H x 4.5" in Diameter. ilFornino® Platinum Plus is built tough and is one of the best ovens money can buy! The steel quality is amazing. It was defining made with care. I baked pizzas and pies. It cooks very well. Satisfied! I have only used this oven a dozen times, but I am very impressed. Very well built and holds heat well. It bakes great pizzaz and pies. 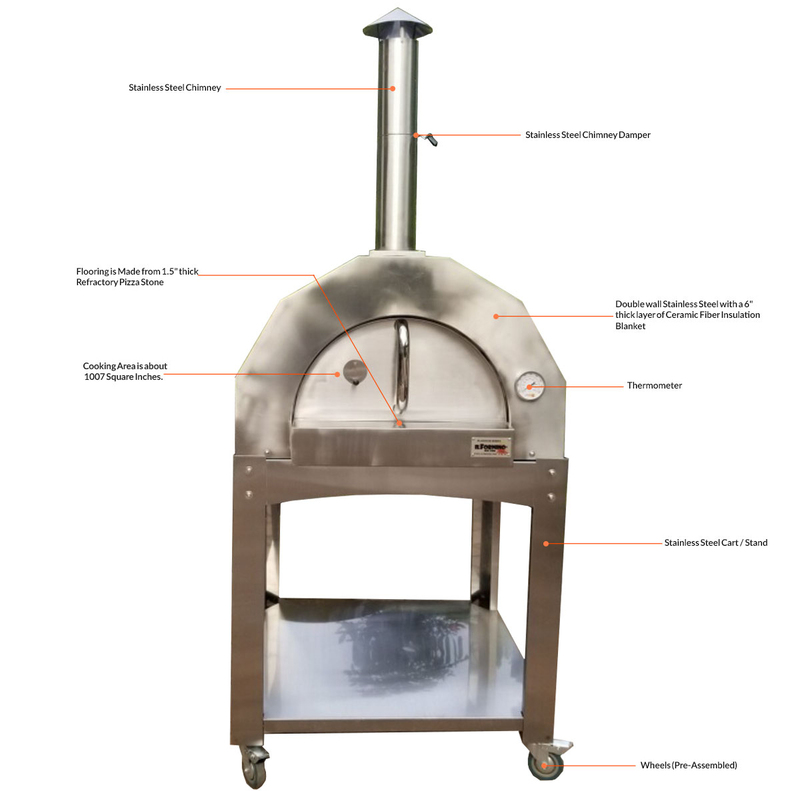 The oven works very well, got the oven about 4wks ago have cooked about 30 pizzas. Baked bread, bagels, pies, cookies. No complaints here. Fired it up and cooked five pizzas. No learning curve. No problems at all. The oven heated quickly and stayed hot for a long time. I am really happy that I bought this oven and this is my lifelong investment to spend some precious time my family members. We usually cook pizzas and create some mesmorizing moments together. Oven get heat up very fast & in couple of seconds pizza will be ready to cook. Quick and easy shipping to my door!